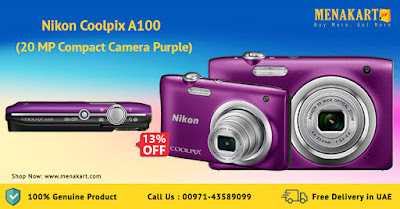 1-Coolpix A100 has an effective pixel count of 20.1 megapixels and is equipped with a 5x optical zoom (10x when dynamic fine zoom is used) Nikkor lens that covers the wide-angle 26mm to telephoto 130mm (equivalents in 35mm  format) range of focal lengths, all in an extremely portable, slim body with a depth measuring approximately 19.8mm and a weight of approximately 119 grams. It is a stylish model equipped with a number of features that make taking and editing photos fun. For example, scene auto selector makes capturing beautiful, high-quality photos easy with the camera doing all of the work and functions such as Glamour Retouch are easier to use with adoption of a new creative slider.